In vivo, tissue is highly vascularized to provide nutrients and oxygen necessary for cell survival. Furthermore, complex tissues, such as the liver, contain multiple fluidic systems (cardiovascular, biliary, and lymphatic) that do not directly connect yet interact via biomolecular mass transport. 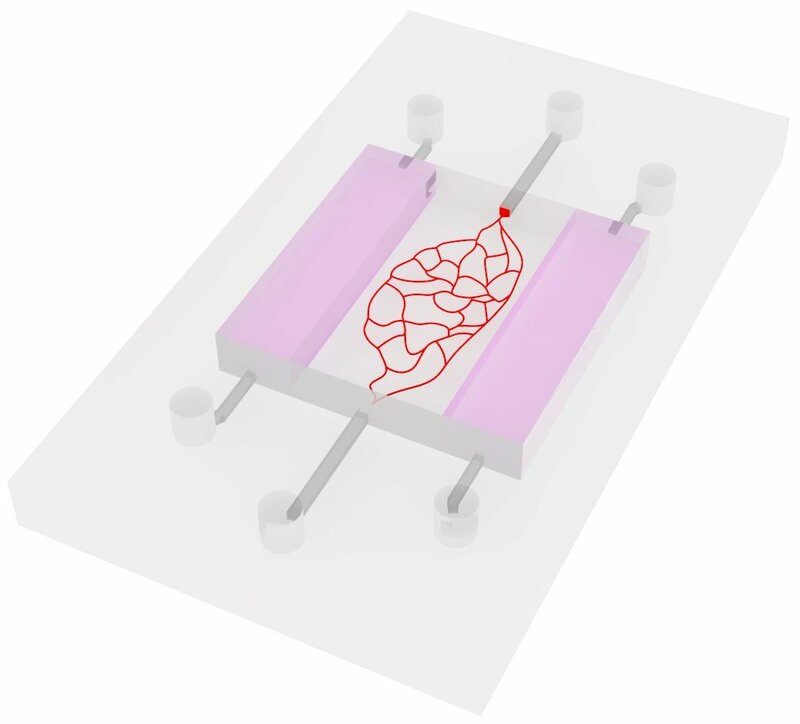 The ability to recapitulate complex in vivo fluidic architecture in synthetic constructs could open new avenues for the implementation of biomimetic microtissues for many in vitro applications including disease modeling, organ-on-a-chip and human-on-a-chip devices, and high-throughput or patient-specific drug screening models. Toward this goal, we are developing a laser-induced, photocavitation-mediated hydrogel erosion technique to locally degrade synthetic and natural hydrogels in desired 3D configurations for the fabrication of complex 3D microfluidic systems derived from native tissue lymphatic and cardiovascular systems. Read more about this exciting research!!! Heintz et al. “Fabrication of 3D Biomimetic Microfluidic Networks in Hydrogels.” Advanced Healthcare Materials. (In Press: Published online 05/30/2016. DOI: 10.1002/adhm.201600351). Heintz et al. “Fabrication of 3D Biomimetic Microfluidic Networks.” Biomedical Engineering Society 2015 Annual Fall Meeting. Tampa, FL. October 7-10, 2015. Heintz et al. “Fabrication of Biomimetic μfluidic Networks Using Image-Guided Photocavitation-Mediated Hydrogel Degradation.” Proceedings of the Society for Biomaterials Annual Meeting and Exposition (2015). There have been tremendous advances in the detection and treatment of cancer over the last 40 years leading to a significant increase in the 5 year survival rate, yet the ability to prevent, diagnose, and treat metastatic cancer remains a significant hurdle in reducing cancer associated mortality. Metastasis is responsible for 90% of cancer mortality indicating the need for better metastasis models, metastatic potential diagnostic tools, and metastasis specific treatment strategies. This research focuses on the generation of a three-dimensional, cardio and lymphatic vascularized, in vitro model that more accurately recapitulates the in vivo metastatic environment than any existing model. The metastatic model consists of a cell degradable “base” hydrogel laden with independent cardio and lymphatic microfluidic systems containing functional vascular and lymphatic endothelial cell (EC) lumens respectively; flanked by cell degradable “tumor” hydrogels containing cancer cells. The device allows for direct visualization, via confocal microscopy, and quantification of the multistep processes during metastasis: cell invasion from the “tumor” into the vascularized “base”, intravasation through the EC lumenized cardio and/or lymphatic systems, and extravasation from the circulation into the surrounding matrix. We are applying this model to: (i) gain insight into the molecular mechanisms and environmental factors that drive metastasis, (ii) develop a diagnostic tool to quantify the metastatic potential of a patient’s cancer, (iii) develop personalized treatment strategies, and (iv) provide a high-throughput platform for new treatment development. Over 600 diseases that damage the central nervous system (CNS) have been identified but relatively few treatments exist. Despite significant investment by many researchers, there have not been any successful protein-based medicines developed to treat brain diseases including Alzheimer’s. There are many reasons why therapeutics to treat brain diseases do not exist but one major pitfall lies in the current drug development pipeline. Preclinical screening of new drugs is performed using overly simplified in vitro models followed by animal testing. Unfortunately, these screening approaches do not accurately recapitulate transport in the human brain and drugs that pass preclinical screening often fail in humans. This dismal success rate indicates a clear need for superior preclinical screening models. 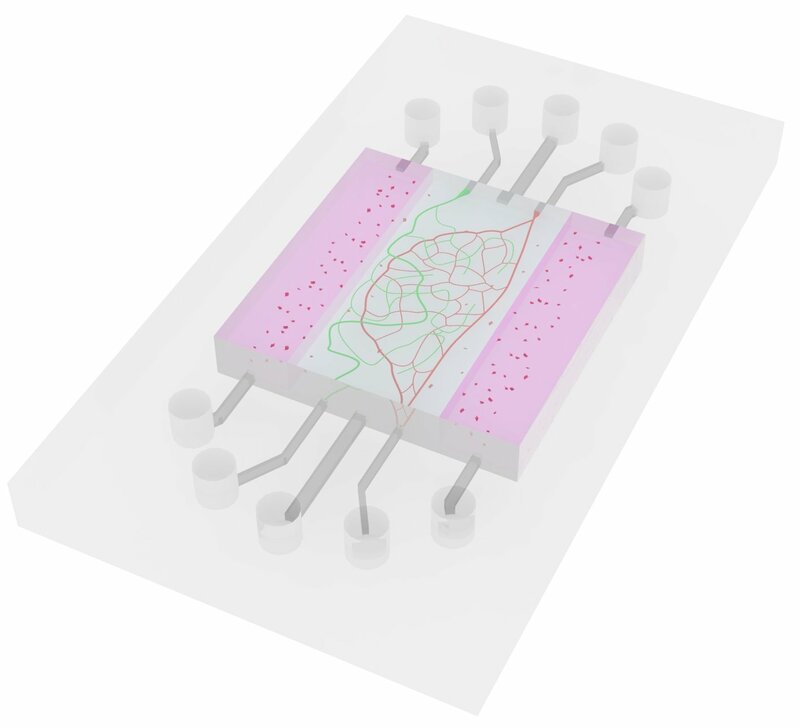 The National Institutes of Health has recognized this problem and recently started a Tissue Chip for Drug Screening Program with the hopes of creating microfluidic in vitro drug screening models that more accurately recapitulate transport in the human body than existing models. Toward this goal, we are developing a three dimensional, microfluidic in vitro blood brain barrier model that more accurately recapitulates transport in the human brain by (i) utilizing human BMECs that express the proper transporters, (ii) induction and maintenance of BBB function via applied shear, and (iii) use of 3D microfluidic networks derived from the vascular architecture of the human brain. Implementation of this model will aid preclinical screening of brain-specific therapeutics leading to increased clinical success as well as lay a foundation for development of in vitro culture models of CNS diseases. This work is performed in collaboration with Dr. Kelvin Lee in the Department of Chemical & Biomolecular Engineering at the University of Delaware. Micropatterns that regulate cell shape or spreading have provided much insight into tension-mediated control over cell fate. All of the patterns implemented to date have been derived from simple shapes (circles, squares, triangles, etc.). Although these simple patterns allow for control over cellular tension they do not provide a means to recapitulate the cellular architecture or tension state of a specific cell of interest (COI). To address this limitation we have developed Image-Guided Laser Scanning Lithography to fabricate cell-derived, biomimetic patterns. Two pattern configurations are derived from each COI: one consists of a continuous pattern derived from a COI’s morphology and the other a discontinuous configuration composed of many subcellular-sized patterns derived from an image of a COI’s adhesions. 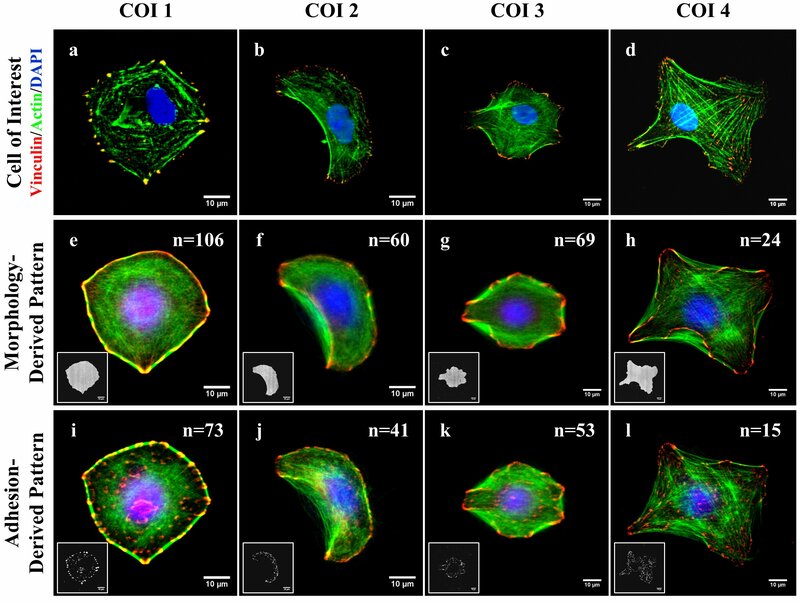 Cells cultured on both pattern configurations display an architecture (morphology, adhesive state, cytoskeletal organization, and nuclear properties) that quantitatively recapitulates the COIs that defined the patterns. Slight modifications to pattern design allows for suppression of user-chosen, specific actin stress fibers and modulation of adhesion site dynamics. This approach to patterning provides a strategy to decouple the influences of cytoskeletal structure, adhesion dynamics, and intracellular tension on mechanotransduction processes and potentially the ability to recapitulate the adhesion site signaling state and phenotype of user-chosen COIs. Shukla et al. “Biomimetic Surface Patterning Promotes Mesenchymal Stem Cell Differentiation.” ACS Applied Materials and Interfaces. (In Press: Published online 12/17/2015). Slater et al. “Recapitulation and Modulation of the Cellular Architecture of a User-Chosen Cell of Interest Using Cell-Derived, Biomimetic Patterning.” ACS Nano. 9, 6128–6138 (2015). Slater and West. “Fabrication of Multifaceted, Micropatterned Surfaces and Image-Guided Patterning Using Laser Scanning Lithography.” In: M. Piel and T. Théry, editors. Micropatterning in Cell Biology Part A, Vol 119. 193-217. Methods in Cell Biology, Elsevier Academic Press (2014). Cell-based therapeutics are considered the next generation of clinical treatment but a major limitation of this technology is the lack of a cell source that is easily accessible, expandable, and that avoids inducing an adverse immune response. The ability to use an autogeneic cell source such as bone marrow- or adipose-derived mesenchymal stem cells (MSCs) is currently being tested in a number of clinical trials. While naïve stem cells show promise for use in cell-based therapies, the ability to induce potent differentiation toward a desired lineage prior to use would benefit many treatment strategies but is difficult to achieve with existing methodologies. Soluble factor cocktails have traditionally been used to induce lineage-specific differentiation, but more recently, modulation of the extent of cytoskeletal tension generated by cells through manipulation of cell shape or spreading or by culturing cells on substrates with biomimetic stiffness has proven a viable alternative. While the exact mechanisms that govern tension-mediated control over cell fate remain elusive it has been speculated that adhesion sites govern tension-mediated intracellular signaling events thereby acting as mechanosensors that convert mechanical cues into biochemical reactions. Recent findings indicate that modulation of cytoskeletal tension can make cells more sensitive to or even override the influence of soluble signals potentially through adhesion-mediated signaling. While previous studies have demonstrated the ability to induce lineage-specific differentiation through modulation of cell shape or spreading this research uses a newly developed cell-derived patterning strategy that generates pattern configurations from an image of a cell’s adhesion sites. The potential to recapitulate the tension and dynamic signaling state of adhesion sites of differentiated cells in naïve MSCs to induce efficient and robust lineage-specific differentiation is being investigated. We are examining how dynamic changes in tension are distributed across adhesions in differentiated cells to test the ability to recapitulate the same dynamic state in naïve stem cells using cell-derived, biomimetic patterns. Relationships between dynamic changes in adhesion site tension, magnitude of tension generated, and lineage-specific differentiation are being determined. This research provides a strategy to potentially increase the potency of lineage-specific MSC differentiation through tight regulation of adhesion site signaling dynamics using biomimetic pattern configurations. These are milestones along the way to fulfill our long term goal of creating “primed” autogenic cell line banks for use in cell-based therapeutics and personalized medicine.